Thank you Bigrock. You are an epic fail! I am writing this after a great call with one of your support guys (Kaushik) for a brief 3 minute. I was talking with one of you support execs “Chaithra” who bluntly put me off the phone after talking for 35 minutes because “she was having no answer to my question“. Then I called again and spoke to Kaushik, asked her to get me connected with Chaithra and he said – “she is telling that she has already escalated the issue to senior team and I shall wait for a reply” and she refused to speak to me further. After reading this, you must think that I am one of those customers who speak to support executives for fun and if get lucky to talk with female execs, do so-called “Time-Pass” with them. If you do, Thank you. 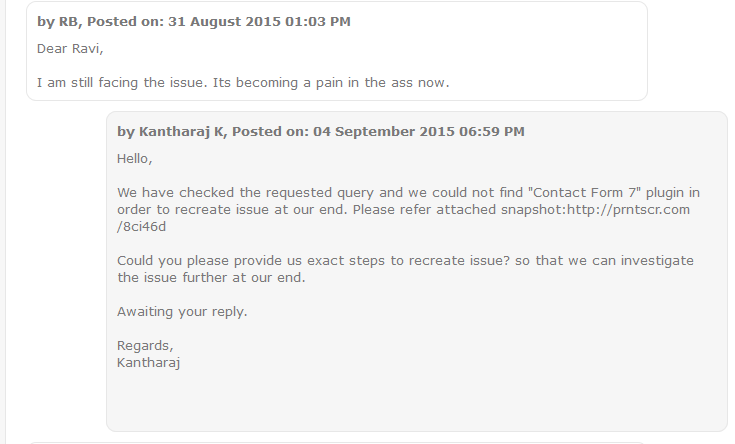 If you don’t and want to resolve the issue, read on. How long should it take for you to install/update a plugin via the admin section on a WordPress blog hosted on your domain??? The answer should be a minute, 2 minutes and depending on your connection speed, should not be more than 5 minutes. Here’s the issue. 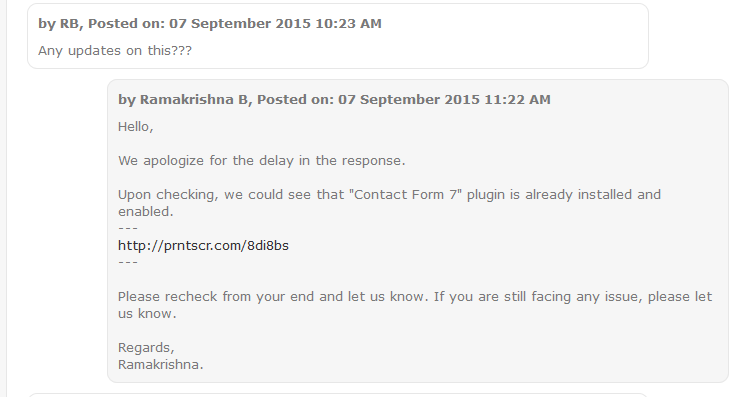 I am UNABLE to install most recommended plugins like Contact Form 7, Jetpack by WordPress.com, WP Super Cache to name a few of them from around 15 days on Bigrock hosting and you’re unable to resolve the problem. 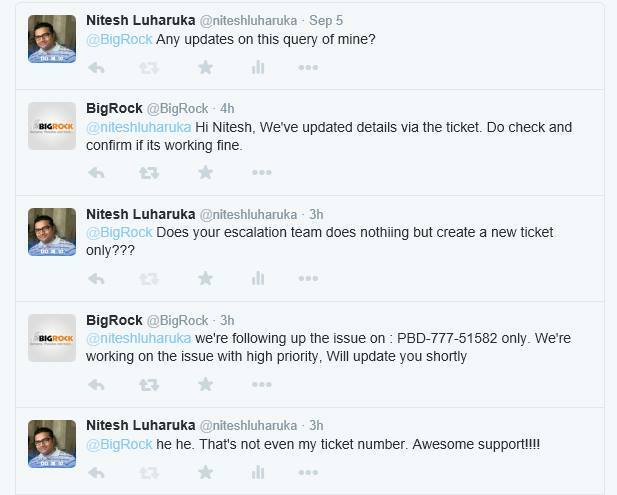 Dial Bigrock & tell the Ticket # to the support exec. They will keep you on hold for around 3-4 minutes to get the details of the ticket and then talk to you. You re-explain the problem to them because every time a new support executive picks up the call and if you ask them to connect to the executive you have talked with (Don’t worry, you will need to tell the name of the executive and their system doesn’t know this. ), they will put you on hold for another 1-2 minutes and then say, he/she is busy right now and can’t take this call. So, re-explain the issue every time you give a call. If you question them a lot, they will put you on another hold for 10-15 minutes to discuss the problem on spot with their admin team (Mind you, this is not the technical team, it’s the admin team they refer to). same ticket and then waiting for days. 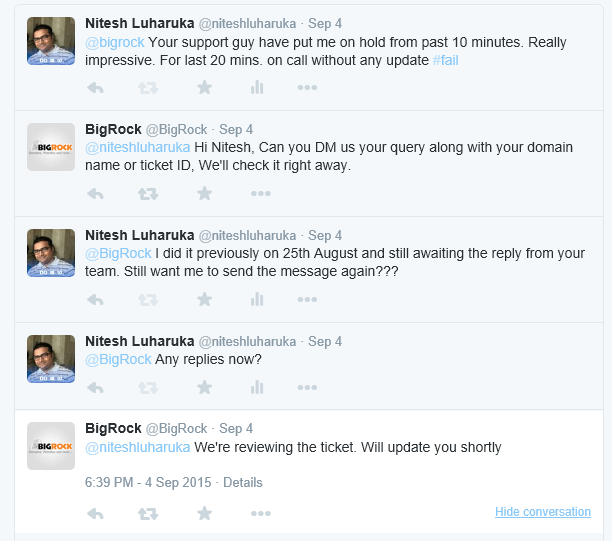 Moreover, you support team does the least to check what reply they’re giving. I believe if an issue is NOT resolved, the same Technical support executive should work on this rather a different executive working on the same issue every time I reply back. Isn’t it logical??? So, after getting pissed off by calling few times, I decided to escalate the issue to your seniors. I email them at your email address and what the escalation manager does???? He/She creates a NEW SUPPORT TICKET FOR ME. Seeing the recent trends, I hope YOU/BIGROCK will look into this and my issue will be resolved only if you’re listening.